It Starts With Food outlines a clear, balanced, sustainable plan to change the way you eat forever--and transform your life in profound and unexpected ways. Your success story begins with the Whole30(R), Dallas and Melissa Hartwig's powerful 30-day nutritional reset. Since 2009, their underground Whole30 program has quietly led tens of thousands of people to weight loss, enhanced quality of life, and a healthier relationship with food--accompanied by stunning improvements in sleep, energy levels, mood, and self-esteem. More significant, many people have reported the "magical" elimination of a variety of symptoms, diseases, and conditions in just 30 days. Now, Dallas and Melissa detail not just the "how" of the Whole30, but also the "why," summarizing the science in a simple, accessible manner. It Starts With Food reveals how specific foods may be having negative effects on how you look, feel, and live--in ways that you'd never associate with your diet. More important, they outline their lifelong strategy for eating Good Food in one clear and detailed action plan designed to help you create a healthy metabolism, heal your digestive tract, calm systemic inflammation, and put an end to unhealthy cravings, habits, and relationships with food. 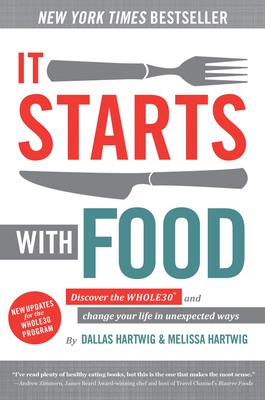 Infused with the Hartwigs' signature wit, tough love, and common sense, It Starts With Food is based on the latest scientific research and real-life experience, and includes testimonials, a detailed shopping guide, a meal-planning template, a Meal Map with creative, delicious recipes, and much more. DALLAS HARTWIG, MS, PT, CISSN Dallas Hartwig is a Certified Sports Nutritionist, licensed physical therapist, and functional medicine practitioner who specializes in addressing the underlying causes of disease using a systems-oriented approach. He co-owned and operated a strength and conditioning facility until founding the online community Whole9 (whole9life.com) with his wife, Melissa, in November 2009. They live in Salt Lake City, Utah, and travel worldwide to present health and nutrition seminars. MELISSA HARTWIG, CISSN, RKC Melissa Hartwig is a Certified Sports Nutritionist and RKC-certified kettlebell instructor who specializes in helping people change their relationship with food and create lifelong, healthy habits. She shares resources, writes articles, and provides support to more than one million people a month through the Whole30 website (whole30.com).